It should give 10 to 14 hours of computing power, but man it's ugly! Wow. I just happen to see that battery on the web a couple of hours ago. I wondered what it would look like. FUGLY!!!! I dunno, I feel like It could have been designed much better. I hate it when accessories don't match the form factor of the device. is there a similar model for the 900? Originaly designed for the 1000H what´s the reason for the form faktor. But ALSO for using with the 901. 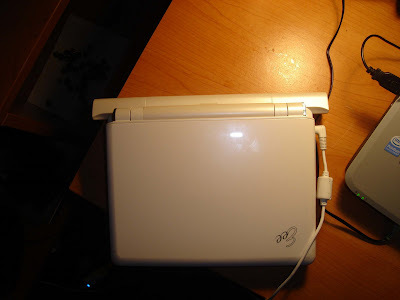 As Piet said, this Battery is designed for 1000-series, they look really nice on it. LOL, sorry for 901 guys. I have a 1000H, so it is for me looks very beautiful. I like it. It's a diffusor,and it proofs the Eee can get even uglier. Yo battery so ugly that when put on the beach, cats try to bury it. 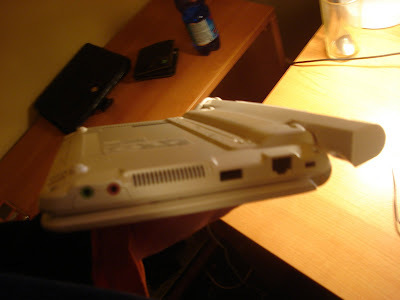 The idea is that the battery shouldn't make a hump beneath the battery, like all other battery packs. So in that sense it's nice. its a shame "legitimate" bloggers like jkk post misleading stories like this in hopes of getting extra hits & mirrored on Engadget. when everyone full well knows this battery was originally designed for the 1000.
its this kind of stuff that makes someone lose credibility. I read somewhere that this battery was not so good. I never post for hits. They sell it for 901 too and it's ugly... I think it's good to share how it looks on it. they sell it for 901 because the batteries are cross compatible. but obviously it was designed for the 1000.
even if you only show the 901 picture you still purposefully left out of your article it was designed for the 1000.
so yes jkk, EnG, & jkontherun all posted the story in the exact same way for hits. the picture of it on the 1000 wouldnt have gotten any hits or even a story at all probably. why deny what we all know is so obviously true? 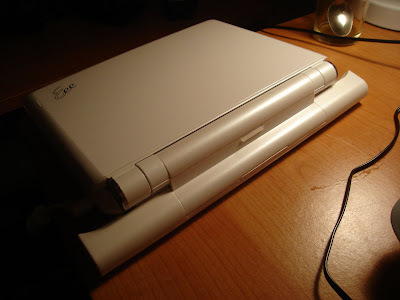 Instead of quarreling on hits, and considering that all the news have to be potentially considered as hits, what about bigger batteries for eeepc 900a? Do the batteries for 1000 work also on 900a? any idea when the Asus 901 16gb will arrive in the US? There should be a battery coming for 900a too..
10 hours would be insane, thank god i have a 1000. I want to see something for the original 900 like that. I want that kind of battery life, but I don't want to buy that giant brick of a battery that is the 10400 mAh. Do 900A batteries work with the 900? Probably not, I bet. omg this sure is ugly... i will stare at anyone use it.. lol..
What's your major investment in this battery that makes you so butthurt when someone posts a less than flattering picture of it? You're either forming a weird attachment to some impersonal corporation, or you are an astroturfer. No one cares. Misleading article, nowhere does it mention the fact that it was designed for the 1000 series. This is the first time I've visited jkkmobile... and unfortunately the last. This could have simply been solved by the author providing an update at the bottom with a link to the photo of the 1000 with the battery. @MamiyaOtaru: it's not the fact that the battery needs to be "defended" as such, but rather the fact that we were all tricked - it's like saying size 14 shoes look ridiculous with size 10 feet... Sure size 10 feet would fit in size 14 shoes but size 14 shoes weren't made for size 10 feet! If you're making field-recordings on an EEE with a USB microphone, 12 hours in the field is worth the naff factor. 14 hours would be great, but beauty is in the eyes of the beholder i guess.